The City of Toronto developed the F.G. Gardiner Expressway Strategic Rehabilitation Plan in order to rehabilitate and keep the entire Expressway in a safe and operable condition, now and in the future. With the effects of age, heavy usage, weather and salt, this is critical work that needs to be done. 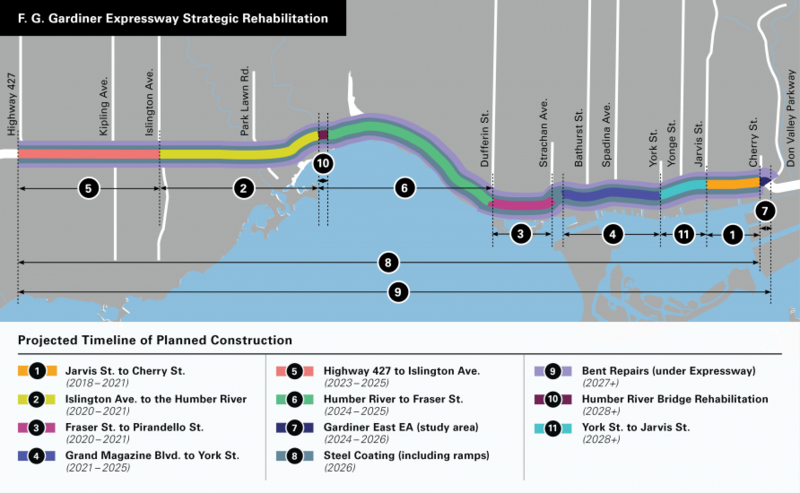 The City of Toronto developed the Strategic Rehabilitation Plan concurrently with the Environmental Assessment of the Gardiner Expressway East. The plan establishes the immediate and long-term rehabilitation needs of the expressway. The Gardiner Expressway East work will realign the expressway from Jarvis Street to approximately Logan Avenue and help transform the area to improve transportation corridors and provide more efficient public transit and new public facilities. The graphic below provides details about the City’s planned construction and projected timelines for projects in the Gardiner Expressway Strategic Rehabilitation Plan. These timelines may be subject to change, but this provides an overview of the planned future rehabilitation work. Find out more about the City’s work to rehabilitate and realign the expressway. Learn more about the future of the 2.4-kilometre easterly section of the Gardiner Expressway, running east of Jarvis Street to approximately Logan Avenue. The City will begin construction to rehabilitate the Gardiner Expressway from Jarvis Street to Cherry Street in summer 2019. In 2018, the City completed work to construct a new off-ramp from the eastbound Gardiner Expressway to Lower Simcoe Street. This project included the removal of the York-Bay-Yonge off-ramp and improvements to Harbour Street.